I wrote Writing and Healing: A Mindful Guide for Cancer Survivors to help cancer survivors gather and to create groups themselves for no more than the price of the book–as all you need is described carefully in the book. You can also use the book alone with the meditation CD (included), but it is recommended that you have a writing partner to share and listen to each other’s writings. Finding Participants. Hang a poster and sign up sheet in your local hospital to find others who have interest. One woman has let me know that she is partnering with a nurse at her local hospital. Location. Support groups often meet in a home or in a church space. Ask if a spiritual director at the church might want to partner with you. Time Frame. When I run a group, I schedule six weeks and then have a break. This way, participants don’t have to make a long term commitment. Group Size. The group should have a minimum of four people to be most successful. It will grow in time. No Writing Experience Necessary. Make clear that no writing experience is necessary, as the objects, pictures, and poems prompt the writing that takes place.I often hear that survivors interested in a support group are worried about their writing abilities. People so often misjudge their abilities, and are afraid to give new experiences a try. This often happens when going through hard times and when feeling vulnerable. The Sessions in the book are a very safe experience. Writing prompts get people writing so one doesn’t have to create anything on one’s own. 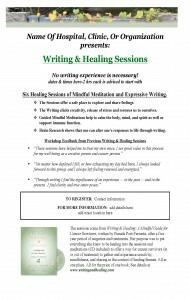 Meditation relaxes participants and is also a guide to writing. I have never had anyone in all these years -unable to write. Promise. 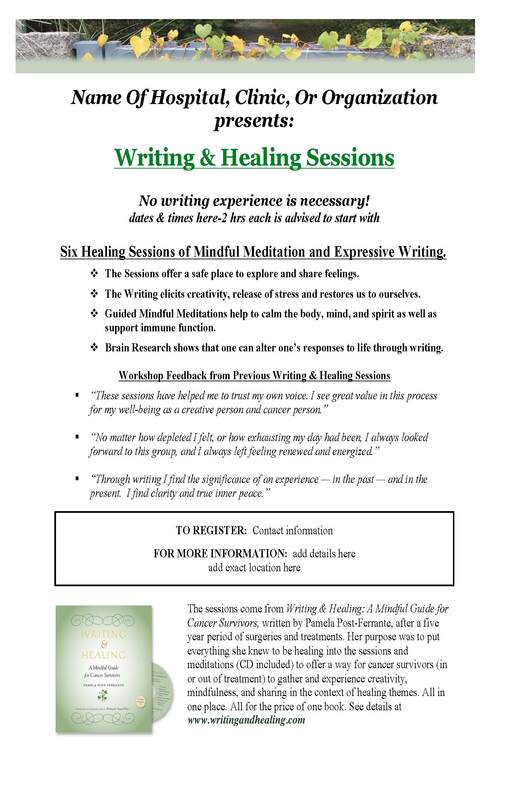 Use this Writing and Healing Flyer as an example or customize it with your specific information. In the blank box provided put in your information: Name of Hospital or Organization or Private Group; Location; Dates and Times (2 hour sessions suggested); How to Register (contact Information). If this is the first time you lead, you will find it requires a bit of preparation to make is successful, but in the end, it will be worth it. As you move forward with your group or on your own, keep me posted. I encourage you to share your success on my Facebook page! P.S. 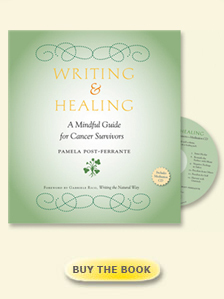 Writing and Healing: A Mindful Guide for Cancer Survivors (ISBN: 978-1-57826-422-3) is available for bulk purchase, special promotions, and premiums. For information on reselling and special purchase opportunities, call 800-367-2550 and ask for the Special Sales Manager.